The Mane Objective: The ULTIMATE 2014 Black Friday + Small Business Saturday + Cyber MondaySale List for Natural Hair!!! 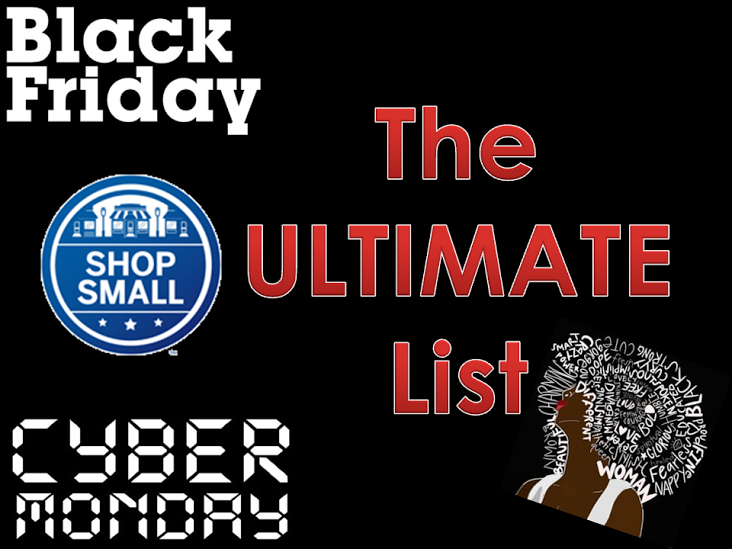 The ULTIMATE 2014 Black Friday + Small Business Saturday + Cyber MondaySale List for Natural Hair!!! It’s here! I've joined forces with Ijeoma (@klassykinks) have joined forces to create the ULTIMATE Black Friday/Small Business Saturday/Cyber Monday shopping list! We scoured the internet and connected with some of the hottest, well-known, and up-and-coming natural hair product, fashion, and accessory brands. Black Friday, Small Business Saturday, and Cyber Monday is a great time to stock up on holy grail favorites and try new brands at discounted prices - just keep in mind the pros and cons of shopping this weekend! Be sure to bookmark this article, and share with a curlfriend! Don’t see a brand listed? Let me know in the comments! We tried our best to reach out to as many brands as possible, but some inevitably slip through the cracks or don’t respond to our e-mails in time. We will keep this list updated as much as we can before the sales start. Discount: $6 shipping on purchases over $35, special $20 pricing on The Cleanse Pack, Moisture Pack, and Curl Pack. Sale Dates: Starts at 8am Nov 27th and ends at 11:59pm EST, Dec 5th. I Recommend: Curls & Lipstick mug -- so cute! Discount: Free domestic shipping. $15 off international shipping. P.S. A little birdie told me they’re having a HUGE sale in December. • Limit one per customer. Coupon Code cannot be combined with other codes. • Coupon Code cannot be used towards the purchase of Gift Sets & Kits. Regular retail price for these items reflects discounts already taken off the individual purchase price for each item included in the kit. • While supplies last. No Rain Checks. No Cash Value. • Sale offer is restricted to retail customers only. Wholesale orders that apply the Black Friday Coupon Code will be voided. Discount: Early Bird Special: $20 off a Q-Redew purchase on Black Friday from 12am-11am CST. From 11am-11:59pm, regular BLACK FRIDAY discount is $15 off. Throughout the remainder of the weekend, the Cyber Weekend special is $10 off a Q-Redew. I Recommend: Great for testing out products! Discount: 10% off plus free shipping for domestic orders over $60. International orders receive $10 shipping credit when they spend $100. Discount: 15% off plus free shipping for domestic orders over $75. International orders receive $10 shipping credit when they spend $100. Don't see a brand listed? Let me know in the comments so I can reach out to them! Check back often for updates as more info rolls in! Great list! Interested in I Love My Fro. I've seen reports of NaturelleGrow on www.etsy.com doing 30% off, but I don't see a code posted yet. Also on www.etsy.com is Annabelle's Perfect Blends with 35% (!) off with the code THANKFUL. I received an email from Jane Carter Solution for 40% off select products. I'm waiting for Qhemet Biologics, Doris New York and Bel Nouvo. Great list, btw. Thank you! OMG, thank you so much! I had no idea that so many offer international shipping. Your website is everything to me! Love it!!! NaturelleGrow ended up doing 31% with the code yay31.